A month or so ago, I attended an event together with one of my favorite food bloggers, Franny Wanny. She was kind enough to bring me an early Christmas gift, which was a small plastic jar that said "Allies Wonder Peanuts" on it. I've had peanuts before, so I really didn't think it was actually anything really special. I thanked Franny for her gift, and went my merry way. I got home a bit late that evening from my event, and I was so exhausted, I left the peanuts on the table. The next morning, I had an early meeting, so I left the house before Rina woke up. A little before lunch, I got a text from her saying "Can I open the peanuts on the table?" So I replied, "Sure, but please take pictures of it first". Ten minutes later, Rina sends me another text message "Where did you get this from??". I answer, "Why, is it good?" She answers back, "YES! Ang Sarap!" Seizing the opportunity, I replied, "I got it for you, baby!" So thank you, Frannywanny for the extra pogi points. For those of you who are familiar with her website, then you are well aware of Frannywanny's exquisite taste in food. Truth be told, Frannywanny.com is one of the sites that I would frequent even before I was a blogger, and her achievements as a blogger is something that I aspire to. (My meeting her in person and finding out she was a wonderful, grounded person as well just made me an even bigger fan) Nonetheless, it dawned upon me that this was a woman who wouldn't give out just any jar of peanuts. There had to be a little magic in it. And it turned out, I was right. These were no ordinary peanuts. 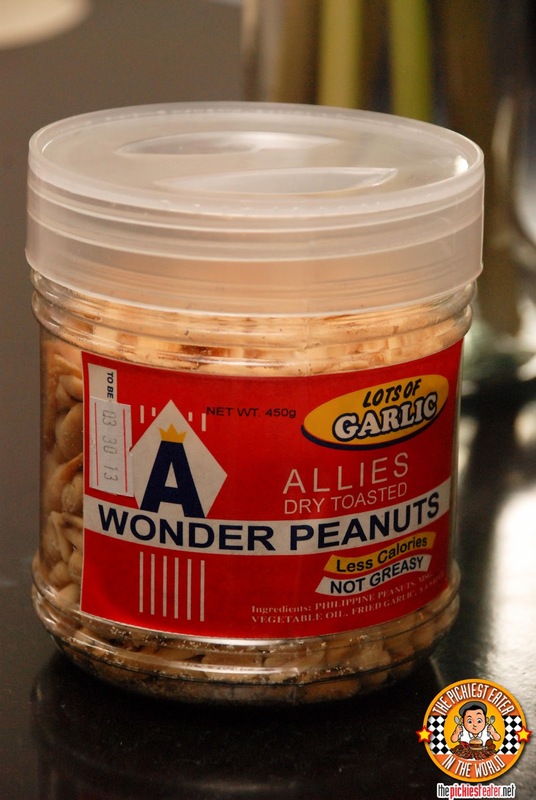 In my opinion, the "wonder" in "Allies Wonder Peanuts" comes from the peanuts itself are not greasy.. AT ALL. You know when you're munching on nuts and the tips of your fingers get all oily and stuff? Well, even at first glance of these nuts, you'll think they in fact look extremely dry. One handful in your mouth will prove otherwise (Yes, I eat nuts, popcorn and other stuff by the handful. It's more fun that way). The peanuts are dry roasted, so they use less oil, making it less greasy, and saves up on the calories. All that calorie counting stuff usually doesn't mean anything to me unless the product is good, and Allies Dry Roasted Wonder Peanuts is quite exceptional. 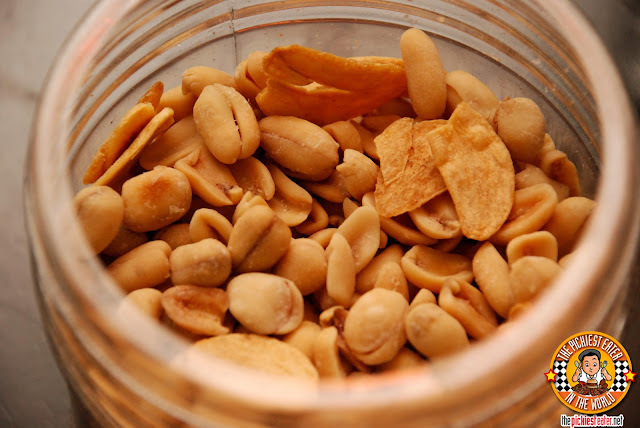 Generously mixed into the nuts are large slices of toasted garlic chips whose flavor has infused itself into the nuts, giving your taste buds a light punch. I'm inclined to believe that Rina's hand went diving into the jar with a search and destroy mission for the garlic, more than the peanuts. Apparently, Allies Dry Roasted Wonder Peanuts is huge in Pampanga, and it seems everyone I mentioned it to had already heard of it. But what surprised them more than anything, was when I told them that they could actually purchase jars right here in Manila! The Peanuts were no longer a "Pasalubong" you ask a relative to get for you when they go to Pampanga! Thank you to my Fairy Godmother Frannywanny for the much needed Pogi Points and the Wonder Peanuts! Allies Dry Roasted Wonder Peanuts is available in two sizes: 450g (See picture) and 800g. awwww thank you richie and rina!!! merry merry christmas!! Where can you get this in Manila? I am from Los Angeles, California and will be in Manila before the end of July. It will be nice to know where I can get them. Thanks!